Receiver Two-Pack (2 Tree Receivers/brackets) - Straps NOT Included. Starter Kit Required - Stand bracket from Starter Kit required to work with the two Tree-Receivers (brackets) from the Receiver Two-Pack. 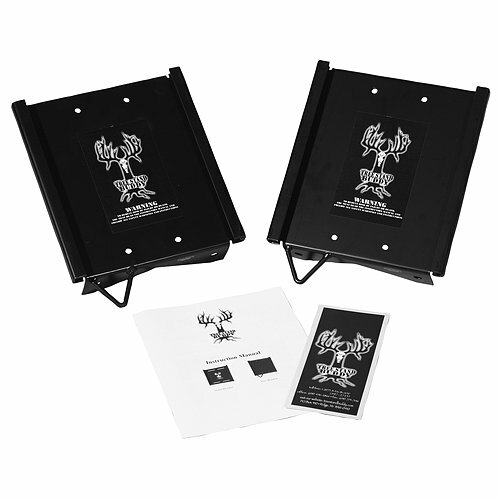 Benefits: Offers a convenient way to set up a tree stand; Designed for multiple tree stand setups; Protects against theft, vandalism and rodents; Designed for added safety and protection; Easy to set up and take down; Lag bolts are optional for added security - allows you to take straps with you when not using stand setup; Easy to change stand location during hunt to react to wind conditions or inactive area; Made in USA. Two (2) extra receivers (tree brackets) for the Tree Stand Buddy. Keep adding extra receivers for as many hunting locations and setups as desired. Set up receivers prior to hunt for big time saver. Change locations during your hunt to react to wind conditions or lack of activity in the area. Assures same stand stand set up every time you install your stand. Leave tree brackets in tree at end of season. Reduces set up time in future. If you have any questions about this product by Tree Stand Buddy, contact us by completing and submitting the form below. If you are looking for a specif part number, please include it with your message.